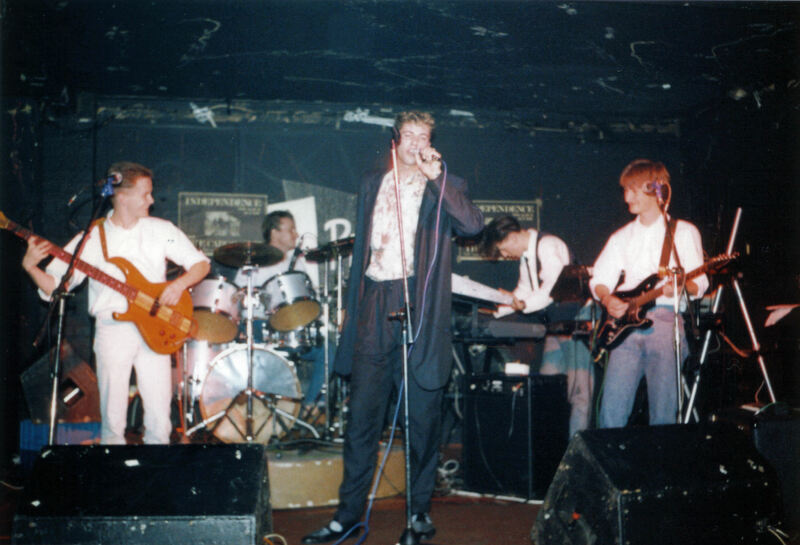 The Big Kiss at the Princess Charlotte in Leicester circa 1987. From left to right: Gary Stewart Smith, Chris Steele, Mark Somebodyorother, Nick Thomas, Andy Kitchinson. I’ve just written a comment on my last post in reply to Nick “The Drum Doctor” Lauro, in which I talked about my previous two (almost three) recording studio disasters. I told him about my last time in a recording studio, way back in 1990 when I was living in Watford and was the lead singer and primary lyricist in a band called The Big Kiss (think Rio era Duran Duran or the short-lived Then Jericho). The short version of the story is: we spent 10 hours in the recording studio, came home, listened to a tape of the rough mix, broke up the band, the keyboard player emigrated to California and I came back home to West Kirby. The two tracks we recorded are some of the earliest examples of Gary Stewart Smith (I refer to myself in the third person only to boost my Google stats) as singer and lyricist. The first – Bullet to Heaven – is about a guy who falls out with his bandmates over some innocuous comment he makes in the pub, who then goes home and blows his head off. I wrote the lyric (to an existing band track) one night after we’d had a rehearsal, decamped to the pub for a cheery post-rehearsal chat, and made some innocuous comment… musicians are such sensitive souls. Even though Nick Thomas (the keyboard player) and I were prolific songwriters, the other two members of the band – drummer Chris Steele and guitarist Jim Somethingorother – decided that they didn’t want to do Smith/Thomas numbers, but wanted to be a part of the whole songwriting process. Kind of akin to Harrison and Starr saying they didn’t much fancy playing on these songs that were only Lennon/McCartney compositions. As I (John Lennon) read through the six lines he had composed in those 60 minutes, I really had to grit my teeth to stop myself from laughing out loud. “What do you think then?”, Chris asked expectantly. “Err, yeah… it’s really umm…” – I struggled to come up with anything that wasn’t going to make me burst out laughing – “doesn’t quite scan though, does it? Do you mind if I tweak it just a little bit, here and there?” Chris then disappeared for another hour to write the second verse, while me and Nick ran to the kitchen, clutching our sides and weeping with uncontrolled mirth. I’m still grinning at the thought even now, some twenty-odd years later. You know, I think I may still have the original manuscript somewhere – I’ll see if I can dig it out. The words themselves aren’t funny per se, it was the whole bathroom scenario – you really had to be there. I can tell you all this now coz I’m sure Chris doesn’t read my blog. But Chris, if you do read my blog: sorry, but.. ha ha ha ha ha ha ha ha!!!! This entry was posted in recording and tagged California, John Lennon, Nick Thomas, Paul McCartney, Ringo Starr, The Big Kiss, West Kirby. Bookmark the permalink. Sounds like typical youthful band scenarios with the struggle for song writing dominance. Very common indeed. It takes maturity to realise who is the best songwriter in the band. If this is achievable, the band may grow to be as lucky as The Police, a fine example of a band who went through exactly the same process. Stewart Copeland reluctantly, eventually and to his better judgement, gave up believing he was the best songwriter in HIS band and gave way to Sting’s dominance in that area. The whole thing was galling, yet amusing at the same time. Nick and I could knock out a song a day, Chris and Jim were never going to be prolific. The annoying/ironic thing is that Chris had been in the original band and had been quite happy playing Thomas/Smith numbers. Actually, come to think of it, it wasn’t Thomas/Smith – I was at the time hiding my light under a very big bushel – it was Thomas and Mark, the tall vocalist in the picture above. He wrote some very personal lyrics that probably raised an eyebrow amongst the rest of the band but at least he had the balls to get up and sing them. Though slightly flat, like Leicester’s answer to Marc Almond. We still had aspirations to be Duran Duran at the time, so I’m not sure if that Duran meets Soft Cell thing woulda worked. You’re probably a better song writer now than you were then but haven’t been in a situation where you can actually see it for real yet. I find experience in life improves people’s song writing abilities – except for mine, as although I can play a few chords on the guitar, I don’t have ‘the gift’. “Probably”? Oh I am! Immeasurably! Seriously, it’s probably the one thing that I have confidence in: the ability to write a good tune and meaningful lyrics. It’s just a shame that I didn’t have the balls or the drive to do anything with that ability – though I like to feel like it’s never too late. I must say I don’t regret the not doing anything, I’m happy that I’ve ended up living here in West Kirby with my beautiful wife and great friends – I have a pretty good life. Who knows where I’d be or who I’d’ve been if I’d gone for it all those years ago? It’s a funny thing, probably a British thing, that I can’t come out and say “yes, I am a talented songwriter”. If I was a well-paid accountant in one of the big three/four/however many, well rewarded, living in a big house with a flash car, I could probably say “what a talented accountant I am!”, but songwriting is a bit more… I dunno. One man’s “best song ever” is another man’s “predictable pop drivel”. I’m sure the majority of mainstream pop/rock fans would like/love my stuff – I just have to record some stuff to the best of my ability and stick it out there… I just need massive amounts of encouragement! I think we find our feet at different times of life. I remember back in 1986 turning down the offer to join a band from Newcastle called Hurrah! No audition needed as I’d come recommended by someone from London Records (don’t know how how that came about but…). At the time I was in a local band who had someone in the Bunnymen’s management looking out for us so I was convinced, in all my youthful niaevety and misplaced loyalty that we were destined for the big time. So I turned the manager’s offer down. By 1987 Hurrah! were opening for U2 on the Joshua Tree tour and my ‘big time’ band were spiraling into burnout with zero achievement. Ok, Hurrah! never had a career much after that, but it would have put me into contact with people in the industry and I could have used it as a stepping stone to something better. However, had I done that, I have absolutely no doubt that I would be living the life I have now and have my kids etc. I may even be dead from drugs. So I guess what happened was meant to be. I no longer subscribe to the ‘it’s too late now’ train of thought due to the way the music industry (there isn’t one any more really) has devolved. What freaks me out is that now we have 20 year old kids cramming themselves into festivals and stadiums to watch the Foo Fighters, Metallica or the Chili Peppers. The list of artists could go on, but my point is that there are kids actively embracing music their dad’s are into and see this with my own kids. My daughter loves Nirvana and Kurt Cobain. If he’d lived he’d be my bloody age now! I even had my own ‘Foo Fighters’ moment with Forty4 last week. We played a place in Macclesfield to a full room, a lot of which were 20 year old student types digging the music of the old arses in my band! Explain?!?!?!?! So I see a completely fragmented music industry now where all the rule books of the past have been ripped up and an almost anarchic order in its place. Record companies no longer have the overall power to tell ‘the kids’ what is cool and what not to listen to. Music of every genre and every age group has now come of age and there’s a cross-pollention of respect across the generations. So don’t sit by any more and wonder what might have been because the time to do anything has always been ‘now’. The past is history with old rules and now has never been a better time to simply play and record your music and see what happens.